One, spending a lot of time in a touristy area like (for example) Fisherman’s Wharf can be soul sucking. You feel like you need to see everything and you end up stuck in a tourist trap. Limiting time in these spots lets you see what you want but moves you on to the next thing quickly. The second reason this works out well is you can go back and explore things you want to see more of. It gives you a little taste of everything so you have an overview of the city. The key to doing a three hour tour is having a driver who never leaves the car. This works better if someone has already been to San Francisco but you could totally make it work for two people by trading turns in the driver’s seat. Finding parking in certain areas of town can be time consuming. When I take friends I just pull up to what they need to see, everyone jumps out of the car and then I get the car out of the way for 5 minutes or so and wait until everyone jumps back in. This way we are able to cover lots of ground. Just a warning, if you don’t time it right or get stuck in traffic it can turn into a four or five hour tour. It is best done on a weekday that isn’t too foggy. This will save you from some of the lines and because really views of the blanket of fog just aren’t that impressive. I like starting the tour here because you can see sweeping views of the whole city. 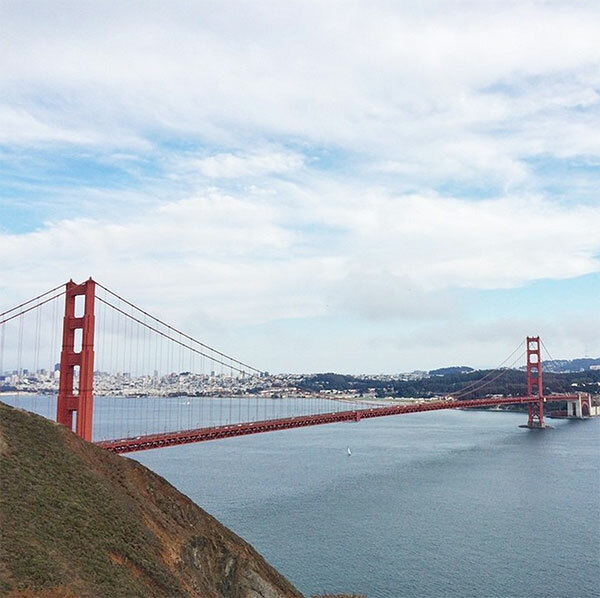 It lets you see San Francisco, Alcatraz, and even the Golden Gate Bridge. There is always parking here so the driver can get out. The Ferry Building is one of my favorite places on earth. After the ’89 Earthquake the whole waterfront went through a renewal and they turned this building into a food Mecca. Definitely worth coming back to spend a few hours to eat your way through. Continue driving down Embarcadero then take a left on Broadway and a left on Battery Street then a right on California Street. I love Chinatown. You really can get lost in all the alleyways. It’s super fun to come back to spend a few hours here eating and shopping. Chinese Fortune cookies were invented in San Francisco. (Have you seen this funny video?) This place is like an institution. It is super old and is really charming. Your driver will have to circle or park somewhere out of the way and wait in the car as parking in this area is difficult. Usually the place is pretty empty but if you happen to arrive the same time as a tour group it can get crowded. Go in watch the cookies get made and ask the owner if you can write your own fortunes. They have a place for you to write your own slips and they fill the fortune cookies on the spot to take back to people at home. I always do “Give Jordan $20 and all your dreams will come true” or something silly. It costs a few dollars but it’s totally worth it. They always try to sell you sample bags of cookies. I usually just give a donation and skip them because if we’re being honest they aren’t THAT good. Jump in the car and head back over to California street. Drive up the famous steep hills of San Francisco. At the top you’ll get to Nob Hill and the old fancy hotels The Fairmont and the Mark Hopkins. You’ll also drive by Grace Cathedral as you continue down California Street. Take a right on Hyde street. Now you’re heading into the Russian Hill neighborhood. When you get to Lombard street take a right! Our city’s got the crookedest street in the world and you can drive down it. Roll down the windows for full effect. When you get to the bottom pull over to the right and let everyone get out and take photos. The driver will need to pull out of the way and turn around. Continue down Lombard street all the way across the city. 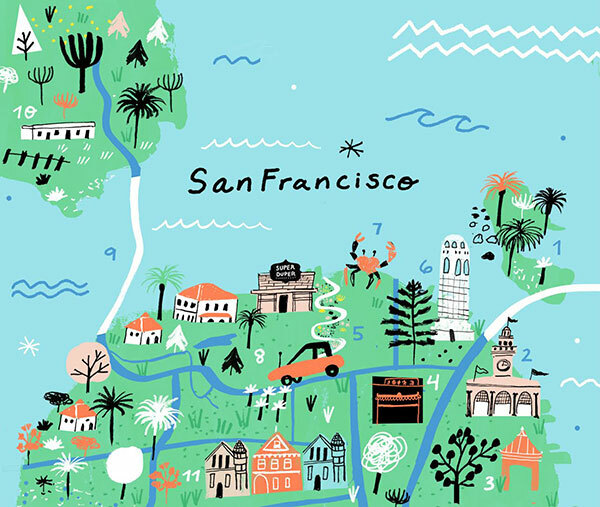 You’ll be driving through North Beach, San Francisco’s Italian neighborhood. Drive right up the hill to Coit Tower. Most days you can drive right up and there is parking available. If it is on a Saturday or busier day you’ll need to have everyone jump out while the driver waits in the car. This place has more sweeping views. They sell tickets to go to the top of the tower but we usually skip that part and get on our way. They are both pretty fast and you can do takeout if you want. They both use really great fresh ingredients and are San Francisco born-brands. If you are doing this on a weekend then there might be lines. If it’s a nice day you can get takeout and have a picnic over at Crissy Field. There is a giant green field in front of the Golden Gate Bridge that is actually part of our national park system. Parking is usually plentiful and it’s nice to get out and walk along the pier and get gorgeous pictures right in front of the Bridge. There are lots of great picnic spots on the field and if it’s grey and chilly you can get some hot chocolate at the Warming Hut by the pier. After Crissy Field we head across the bridge over to Battery Spencer on Conzelman road. There is a pull off there where parking is really difficult. The driver will have to drop you off and wait for parking. This look out takes 5 minutes to walk to but is definitely worth the effort. It puts you on top of the bridge with pretty spectacular views. And that is the end of the trip! Remember if you add in lunch and other things it can stretch into a longer day. Afterwards we usually reward ourselves and get some ice cream and go sit at a park. Because being a tourist is hard work. Thank you so so much!! This is going to be extremely helpful to the hubby and I!! I think we will try to make a day of it as we will need to park. I reallllllly like your Lombard Street specification that “the driver will need to pull out of the way.” Hear! Hear! I live on that block of Leavenworth, and I’m frequently honking those cars that stop and block traffic at the bottom of Lombard. What a fun itinerary. We always spread it all over a few days when we have visitors. The main reason being that we don’t have a car so we need to stick to things that are easily accessible by BART and Muni. Also our visitors have usually come all the way from Australia so they’re here for at least three or four days. We do usually organise a Zipcar or rental car for one day (for Muir Woods/Sauslito/Battery Spencer Lookout) but because we’re already a family of five and we tend to have more than two visitors at once we need to get a gigantic car! My favourite piece of advice for visitors to San Francisco is to avoid taking a ride on the Powell Street cable cars and take the California Street line instead. There’s rarely a queue and the views down California Street and over the Bay Bridge are pretty awesome. AHHHHH! i’ve been checking the site all day but i didn’t actually expect to win. this is so exciting! can’t wait. thanks for such a crazy experience. What a fun itinerary. We have lots of friends and family visiting from Australia so I get to play tour guide quite often which is fun. Because our visitors usually stay for at least three out four days I spread our sightseeing out over a few days. I also do this because I don’t have a car and it’s tricky to fit in too much in just one day! I like to take visitors on the California Street cable car. The views looking down California Street over the Bay Bridge are pretty spectacular and there’s never a queue. That’s always my tip to anyone visiting San Francisco: Avoid the Powell Street lines unless you love standing in queues for a long time! We usually then head to the Cable Car Museum to see how the cable cars work. Because the museum is free it’s a great spot to just drop into for 15 minutes or so. I always leave friends and family to do the super touristy stuff (Fisherman’s Wharf & Pier 39) on their own. They usually want a day to explore on their own anyway and it saves me having to try and drag my kids away from all that Tacky (but fun) stuff! For sweeping views of San Francisco and the Bay my favorite place to take friends and family is my own roof top in Berkeley. We get to sit in the sun and watch that amazing wall of fog roll in and eat the city. I’ll never tire of that view. It really is like nothing else. this is a great idea – we usually do quick driving tours to orient our guests here to copenhagen but i like the notion of writing it all down and getting an accompanying google map. graphic is super cute as well and congrats to whoever won the trip to come see you in SF! this is such a great idea. when we have guests come to copenhagen we usually give them a bit of a drive orientation on way back from airport but I like have it all down in one place with a google map like you have hear. love the little illustration too. and congrats to the winner who gets to come see you in SF! Thank you so much!! My husband and I will be visiting this summer and your 3 hour tour will be so helpful! This is such great timing Jordan, my two boys (under 5s), partner and I are making our first trip to SF next week! Thank you! Lucky ducky to your winner! She is going to have such a wonderful time! Thank you for the mental trip through my beloved city and the illustration is delightful. This is genius. Thank for sharing it. I can’t wait for visitors I can do this with! 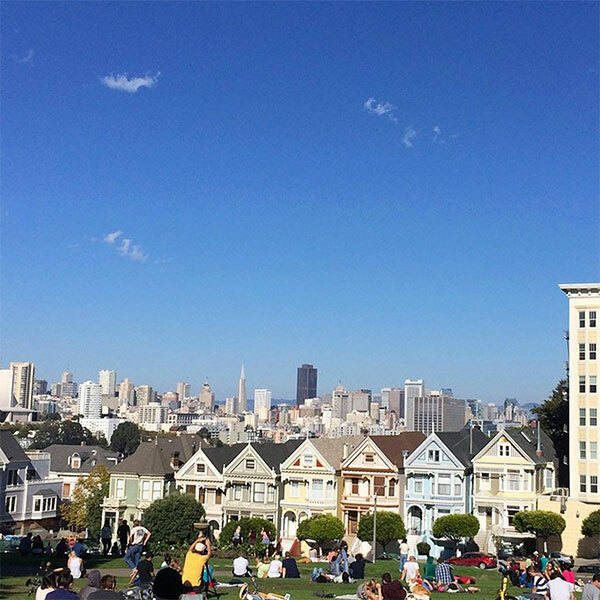 Great tour..but I’m a native San Franciscan and I usually take family to twin peaks….there is so many great things to do in the best city in the world! Also another the most crooked street is not Lombard, but near McKinley square is another sharper st. Not a tourist trap. My aunt lives in San Francisco and we’ve never visited yet lol but if ever we do, this will indeed come in handy. Thanks! I love the map illustration. Would love to visit one day. This is so great! I lived in SF for four years and it was always so hectic when someone visited because there was so much to see and so little time! What a perfect outline for touring! HA! This is so you, ie genius. For that ice cream, you can stop by the original Swensen’s at Union and Hyde. The driver will mostlikely have to stay in the car cuz it’s Russian Hill and parking’s a, um, difficult. If you’re lucky, they might be churning ice cream in the front window. …or you can take an Uber during a baseball game and they’ll have to take you through all of San Francisco to avoid traffic. We had the coolest Uber driver who happened to be the best and most brutally honest tour guide. It was awesome. When we stayed we had a weird trip and the first leg we stayed in a hotel on one side of the city, and the last leg on the other side of the city so we saw all of the main points on foot. Walking to the painted ladies was brutal though, those hills! I would kill for a Super Duper Burger right now!